Sally was born in Copford, and has lived in Lexden for over thirty years. During her early teaching career in Norfolk she painted landscapes in watercolour, and for many years also studied Calligraphy and Lettering Art, from 1994 with Martin Wenham. During this period she sold expressive lettering art through many galleries in Essex and Suffolk, including a solo show in 1999 at Trinity Galleries in Colchester. She continues to work in formal calligraphy, preparing Notarial and Ecclesiastical Faculties and Lambeth Degrees for the Archbishop of Canterbury’s Faculty Office, and regularly updating various church Remembrance Books, and Rolls of Honour. Sally began painting in acrylic in 2005, drawn to the river scenes of Wivenhoe and Maldon, and the beaches of West Mersea. Early experiments led her to realise the crucial role of the sky in affecting the perceived colours and depth of the land and sea, especially in the relatively flat East Anglian landscape. Consequently, right from the start, she has strived to paint accurate and believable skies. Her early work was almost exclusively of coastal scenes and small boats, but she is now increasingly branching out into more diverse landscape painting and still life. Sally still works in acrylic, often experimenting with added oil pastel. Her work is inspired by the rural landscapes and the coast of East Anglia. In the last few years Sally has developed several series of work: 2015 saw the ‘From my garden’ series – twelve monthly still life paintings of flowers and leaves, and also the Peddars Way series of five landscapes. These were painted after walking some of this ancient track-way in Norfolk. The project for 2016 was ‘Twelve Months in an Essex Wood’, studying, month by month the seasonal change in Hillhouse Wood near West Bergholt to the north of Colchester. This resulted in twelve 60cm square paintings, and also books of the same name containing these twelve images plus the monthly notes on birds and animals, flowers, fruits and trees. In the same year Sally walked some sections of The Ridgeway in Wiltshire, resulting in a series of five paintings. ‘A Year on Fingringhoe Wick’ was the theme for 2017’s painting project – a very varied group of twelve paintings of this nature reserve on the Colne Estuary. There will also be a book to accompany this project, which will launch in May 2018. 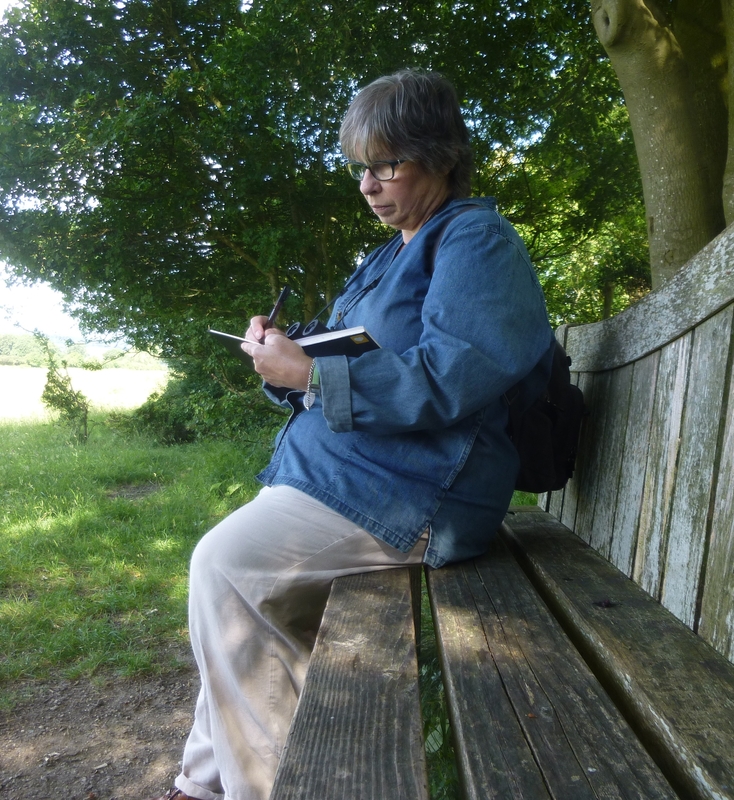 Sally will be focussing on the Essex Suffolk border area in 2018, with a project called ‘Four Seasons on the Stour’, in addition to beginning a new occasional series called ‘Landlines’, looking at aspects of lines in the landscape, both natural and man-made. It is often remarked that Sally’s paintings have an expressive realism and give a sense of tranquillity.